One of the most popular types of symbolic animal tattoos, bird tattoos can represent freedom, peace or war, depending on the species. The earliest recorded tattoos took the form of shapes and lines, done in a ritualistic fashion in order to mark the wearer as the member of a clan, tribe or to show a type of initiation. They were first found to adorn the bodies of Egyptians thousands of years ago, and around 2000 BC, tattooing spread to the Greeks. Here, more than just symbols and lines were used in their tats; actual pictures were beginning to be tattooed on bodies. Birds, as well as other animals, were some of the first pictorial tattoos done on humans. Taking cues from nature meant that illustrations of the things around these early tattoo artists were inspiration for much of their work. These animal tattoos often held meaning beyond the usual symbolism of a particular species - they also designated belonging to groups and societies. There are many different types of bird tattoos that can be inked today, from a detailed portrait of your favorite feathered friend to a stylized mythical phoenix said to symbolize rebirth. 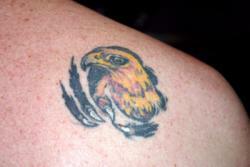 While many birds have been associated with stories and myths for centuries, others have just become popular as tattoos. Bluebirds symbolize happiness, so it's obvious why many people choose to get this bird inked on their body. This type of tattoo dates back to the days of men sailing the seas, when they would spend months away from their families and homes. A bluebird inked on these men held a dual purpose - to represent the happiness of home, as well as to guide them back - the bluebird was said to help a sailor find his way home. In the 20th century, Sailor Jerry helped to re-popularize this type of tattoo. The bald eagle is the national bird and a poignant symbol of the United States. Often seen on men and women who have spent time in the military, the eagle also is inked on those who serve as firefighters, police officers and other government offices. An eagle can be portrayed as a full bodied bird, or just the head may be shown. This bird is a clear representation of the freedom that the US stands for. 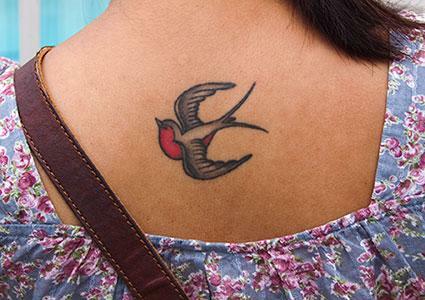 swallow - sailors used to get this tattoo after spending 5,000 miles at sea. A pair of swallows on the chest meant 10,000 miles at sea. As bird tattoos are highly steeped in meaning and symbolism, it's important to do your research before getting a particular bird inked on your body. It's also a good idea to have an image in mind before hitting the tattoo parlor, because many of these birds are not common in flash art. Often you will have an easier time if you make the effort to have a consultation with your tattoo artist before making an appointment for a bird tat.